Buckeye Valley’s Ally Coburn (17) stretches to keep the ball in play while Olentangy Berlin’s Abby Brennan looks on during the first half of Thursday’s non-league showdown in Delaware. 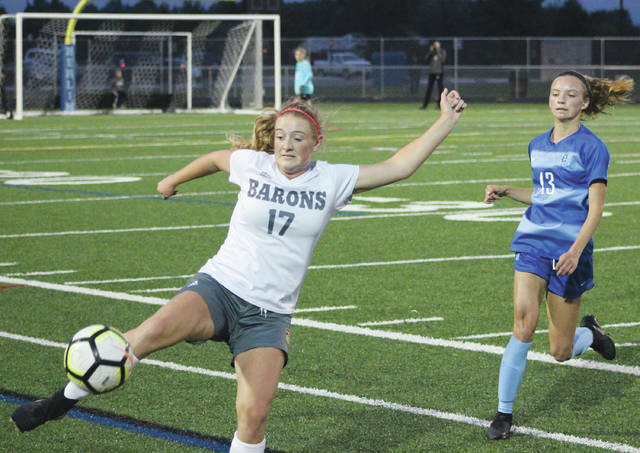 Junior Daelynn Rosser’s second hat trick of the season helped the Buckeye Valley girls soccer team to a 3-1 win at Olentangy Berlin Thursday night in Delaware. The Barons have won three straight and four out their last five games. Rosser’s first goal came on the Barons’ first scoring chance. She went low and to the left to beat the goalie with 32:15 left in the first half. Berlin’s Abby Brennan broke free a couple of minutes later, but her shot missed the goal just right. The Bears had a couple of more chances over the next few minutes, but shots by Olivia Neidhardt and Sydney Walker missed high and wide, respectively. Walker finally got a shot on net in the 18th minute, but BV’s Cami Crawford made the save to keep the shutout. Crawford finished with five saves for the Barons (5-6-1). Berlin goalkeeper McKinley Hoffmann one-upped her counterpart with a save on Rosser and another off a shot by Hannah Cowan on BV’s next possession. Rosser got her second from the top of the box again. This time, she lifted it and beat the goalie high on the left with 31:59 left in the game to give the Barons a 2-0 lead. BV came right back. Sophomore Faith Durbin was fouled in the box and Rosser converted the ensuing penalty kick with 31:05 left. Berlin almost got one back on the next possession, but Cara Susey’s shot from the right hit the crossbar and BV cleared the rebound. But, the Bears finally got one to go in the final minute. Susey found daylight in the middle, but her shot was saved by Crawford. But, freshman Rileigh Glassburn was there to put back the rebound with 21 seconds left for her first-career goal. Hoffmann stopped eight shots and Jessica Burchinal had one save in relief for the Bears (3-10). Both teams return to league play next. BV travels to Galion in MOAC action Monday at 5 p.m. and Berlin visits Delaware Hayes in OCC-Cardinal play Tuesday at 7:15 p.m.